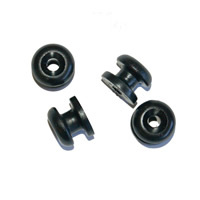 The Lashing Knob is an extra large nylon knob used for holding line and bungee cord up to 1/4" very securely. The Lashing Knob installs quickly and easily using a single #10-32 stainless flat head machine screw and either a nylon lock nut or a water sealing well nut. Do not install with rivets - the knob is too thick to allow the rivet to clamp properly.